Jamie Foxx is no stranger to the world of Spawn that Todd McFarlane created. The actor revealed in a new interview that he approached McFarlane back in 2012 to throw his name in to the hat for a shot at the role of Spawn. Jamie Foxx also revealed how he pitched the character being both "good" and "evil." Talks of a reboot for the franchise have been going on for nearly 20 years and McFarlane has been the one doing the talking, mostly publicly over the last several years. But now, the Spawn movie is officially happening with Jamie Foxx in the titular role and Jeremy Renner as Twitch. 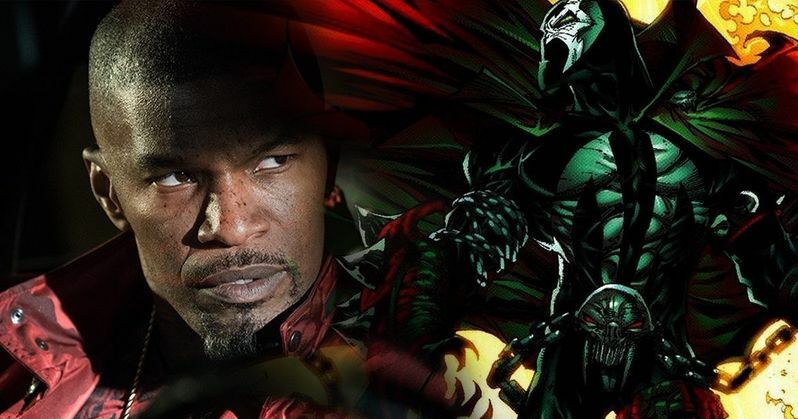 Jamie Foxx says that he flew out to Phoenix, Arizona six years ago to meet and talk with Todd McFarlane about the main role in the upcoming Spawn movie, which was not even official at that point in time. Foxx said that he had done all of the research on the character and the comic book series, telling McFarlane that he wanted a chance to be the first one considered. Foxx told McFarlane that he wanted to be both "good" and "evil." He explains. "Six years ago, I flew to Phoenix to find this man and throw my hat in the ring. I had done all my research on Spawn. I know everything about the character and what he had done. He was taken aback. I said, Whatever you decide to do, I wanna be first up. And what I tried to do is stay artistically in shape. Of course, there's the aesthetic sense of what Spawn is, but in the cerebral sense, in (McFarlane's) script, Twitch (to be played by Jeremy Renner) is going through something. He prays to God, nothing happens. Should he pray to the devil? Spawn interjects himself into Twitch's life and Twitch says, Who are you? I said that I want to stay artistically in shape so I can deliver the line or the feeling: I'm both. I'm good and I'm evil. I was blessed by God, but I was raised by the devil." The meeting that Todd McFarlane had with Jamie Foxx obviously paid off for both men. Spawn is now one of the most hyped comic book projects that is currently in development. Foxx also admitted to taking the role to a competitive attitude. The actor was, and is still convinced, that nobody could take on the role better than he could, and McFarlane obviously agrees. Foxx had this to say. "When I explained that to him, those years back, luckily it stayed with him. Even when he was still met with the task of finding who it was, I said, I challenge anyone out there not to make it competitive. I challenge anyone who was more ready. More ready to give everything. Because you can't challenge someone as far as who's the better actor. Because there's always better actors, better actresses. It's what you bring. Things worked out." As far as when Spawn will begin production, Jamie Foxx admitted that he wasn't sure at this time. However, he admitted that there is still a lot of work going on in the pre-production stage. Clay Fontenot, who is one of the stuntmen in the Iron Man suit for Marvel Studios is hard at work designing the look of Spawn right now, according to Foxx. The actor also added that the character will look unique and that it will have its own identity. Finally, Jamie Foxx was asked if the Spawn movie will have any of the political undertones of other recent releases from Blumhouse, to which he says that he cannot comment on. Instead, he said that Todd McFarlane is the boss and that he's merely "a soldier in this." Foxx continued, "Whatever battle we go into, I'm locked and loaded." There is no current official release date for Spawn, but it's looking like a late 2019 release isn't too much of a stretch. Regardless, Jamie Foxx and Todd McFarlane are ready to deliver the goods. Head over to The Hollywood Reporter to read more about what Foxx had to say about Spawn.